We love to say thank you to those students that stay loyal to us and attend our sessions time and time again! To help us do this, we have launched a membership scheme for those that attend our services for one year or more. And the best thing is, that you don’t have to do anything other than keep attending our sessions, workshops or training. Keep reading to find out more. Once we see that you have attended for one year or more we will send you in the post, or present to you in class, our membership card with your name and an expiry date on it. The card will enable you and your family to get discounts with our selected partners as well as on our own merchandise, performances and selected sessions. When you receive your card, you will also receive a letter with all updated discounts available on it. The card lasts for one year, and can only be used before the expiry date. When your card is due to expire, all you need to do each year is take it to your teacher or our office and request for a new one to be given to you. As long as you are still attending our sessions, you will be able to renew your card. Please see below for the current discounts and terms from ourselves and our selected partners. Keep visiting this page to see any new discounts as and when they are valid. A Mind Apart T.Shirts and Hoodies: Receive £5 off when you order a t.shirt of hoody from us. Your membership card must be in date to receive this. You may be asked to present the card when ordering. 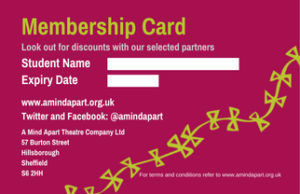 Performances: You will receive discounts or deals on tickets for our A Mind Apart performances. These will be announced and promoted for each performance accordingly. Workshops/Training: You will receive a discount on selected workshops and training delivered by A Mind Apart or other artists we bring in. Discounts for membership card holders will be advertised with the workshop. Where discounts are offered booking will be required via email or phone. West Street, Chapeltown, Abbeydale Road, Crookes, Halifax Road. Keep checking this page for new discounts and deals on offer, and in the meantime for those students that have attended for one year or more, we hope that you are happy with our thank you gift. Please note that stipulations on how you get your discounts with your card may vary, and we and any partners reserve the rights to change the terms of any discounts at any point.